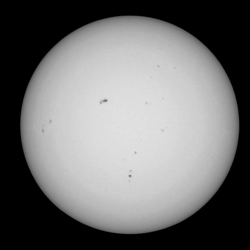 You can find a few amateur pictures of Sun with sunspots on a Sunspots – pictures page (last update 24-07-2013). Some helpful tips and tricks are collected on a "Sunspots" page in the "for pupils" section. The speed of light, or more generally, the speed of electromagnetic waves, seems to be incredibly high. 300 000 km s−1 is far greater than the typical speed of a car, a plane or even a rocket, which is just several kilometres per second. It is thus natural that we treat the speed of light as infinite in everyday life. It appears, however, that even such a high but finite speed causes problems that have to be solved in one of the most popular electronic devices—cellular phones. Here we look more closely how the global system for mobile communications (GSM) phone works and how it deals with the speed of electromagnetic waves. Users of the LaTeX Beamer class may download and use Cracow theme. Cracow is our simple modification of the Warsaw theme by Till Tantau. One of the changes is the addition of the frame number and total number of frames in the lower right corner. More about Cracow theme and files to download. The eighteenth installment of the YAO (Young Atom Opticians) will take place in Cracow, from the 26th to the 30th of March, 2012. The organization of the YAO 2012 meeting has been undertaken by the doctoral physics students of Jagiellonian University, who are closely tied to atomic physics through their scientific research. One can also find there two short movies as supplementary data. An experimental setup allowing the observation of two-laser interference by the naked eye is described. The key concept is the use of an electronic phase lock between two external cavity diode lasers and the shift of the frequency of one of the beams in such a way that the interfering beams are of the same frequency. The relative stabilization of the laser frequencies is realized with a PLL circuit, which stabilizes the frequency and phase of the beat note signal to an external reference. The shift of the frequency of one of the beams is realized in a common way with an acousto-optical modulator.